Fire at the Glasgow School of Art, May 23, 2014. 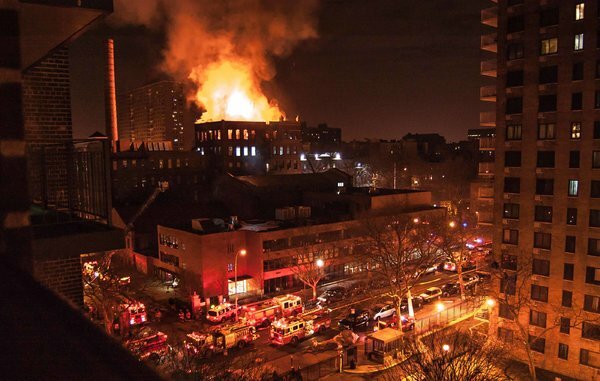 Fire at the Pratt Institute, February 15, 2013. On the morning of February 15, 2013, I woke up to several emergency alerts from my employer. Pratt’s main building had suffered a four-alarm fire in the middle of the night, necessitating 39 fire trucks and 168 firefighters to put out the flames. Somehow the building was saved, though renovation continues more than one year later. The fire fortunately killed no one, though it destroyed papers in administrative offices (including paperwork I had just submitted for an academic program five months in the planning) and several senior art majors lost their work less than three months before graduation. Pratt’s campus still feels the effects of the fire as fences cordon off the building in hopes of completing renovations in time for fall semester. 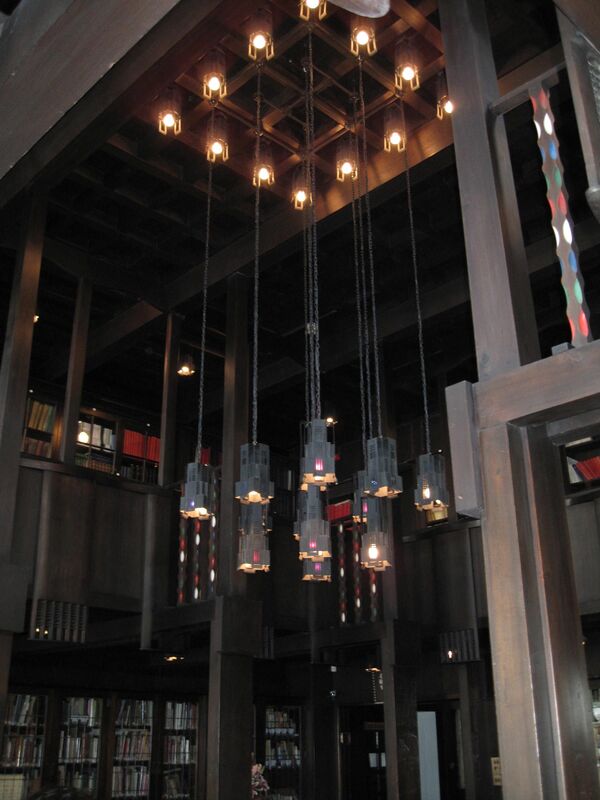 My attempt at capturing the beauty of Charles Rennie Mackintosh’s library in the Glasgow School of Art, 2010. This came to mind when I learned about today’s fire at the Glasgow School of Art. 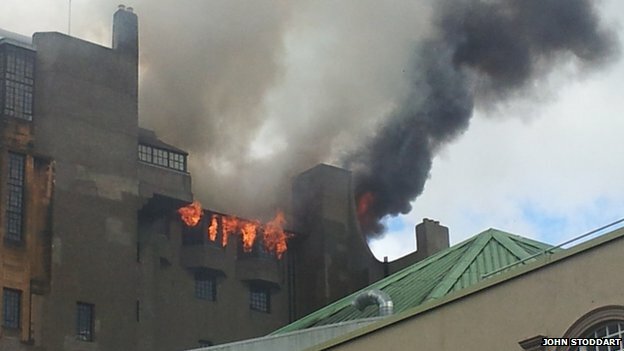 Somehow casualties were avoided despite this fire breaking out at mid-day, but at best Charles Rennie Mackintosh’s magnificent building was severely damaged on all floors. Students were literally hours from finishing their work. I hope and expect the arts community will rally to these students just as it did to Pratt’s students last year. In thinking about the safety of the built environment, I have to ask can these fires reasonably be avoided? I do not know if modern sprinklers were installed at the Glasgow School of Art (built between 1897 and 1909); I did not notice any when I visited in 2010. Had Pratt’s main building (built as the campus was founded in 1887) been equipped with a modern sprinkler system, perhaps the water damage from all those trucks would not have been as extensive. Months after the event, the fire department’s official report listed the cause of the Pratt fire as electrical; from early reports, the Glasgow School of Art fire may have been started by a spark in the basement. My wish in the short term is that the students whose work was destroyed will be afforded all the support and care that is possible. In the long term, perhaps we at art and design schools need to evaluate best practices on fire prevention and safety, especially at heritage buildings created before modern building codes. To the extent that these losses can be prevented, they should be prevented. Beyond that, the community of the Glasgow School of Art has my best wishes as decisions on how to regroup take place. May 24 Update: The fire department reports that the Glasgow School of Art fire is under control, and estimate around 90% of the building and 70% of the contents have been saved. Unfortunately, the library was destroyed. Here is hoping that most student work is intact and that the process of restoring the building both reflects Charles Rennie Mackintosh’s original vision and features 21st-century fire-safety systems. This entry was posted in students, sustainability on May 23, 2014 by Carl Zimring. It is indeed tragic, all the more so because it was preventable had sprinklers been installed. Having made some progress with this during the nineties we have regressed to a detection only mentality in the UK. Keep writing about it please.